Our charism is focused on Transforming the World through Reverence. 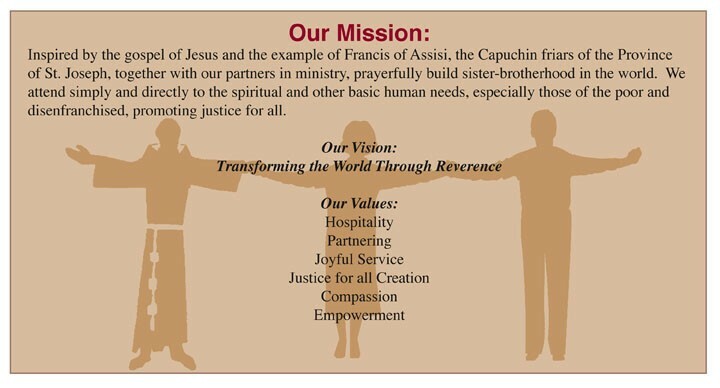 Our Mission: Inspired by the gospel of Jesus and the example of Francis of Assisi, the Capuchin friars of the Province of Saint Joseph, together with our partners in ministry, prayerfully build sister-brotherhood in the world. We attend simply and directly to the spiritual and other basic human needs, especially those of the poor and disenfranchised, promoting justice for all. Empowerment: Encouraging people to realize and respect their own dignity and potential.